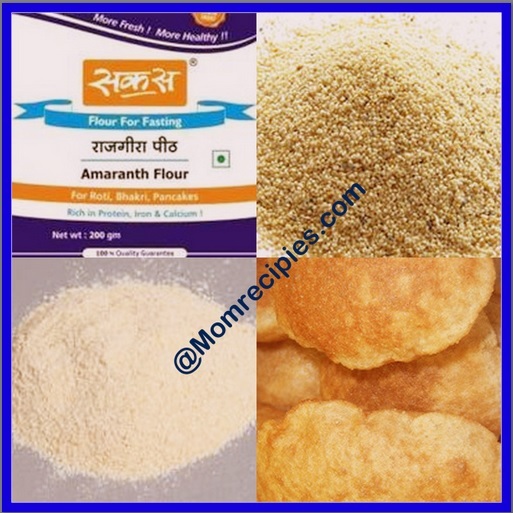 Rajgira pooris are made from rajgira atta (Amaranth flour) .Rajgira atta is gluten free flour. Rajgira flour is allowed to eat during the Navratri fastings or Ekadashi vrat or any Other fasting days. 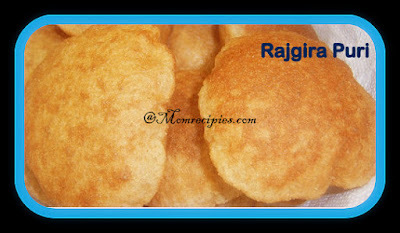 Apart from making pooris, Rajgira Flour is also used to make rotis, parathas, pakoras and even as a binding and thickening agent. Since rajgira atta is gluten free flour so to bind it together I have added boiled potato. These pooris are quite heavy. 3-4 pooris per person with subzi /curry on side is enough as a filling meal. 1) While making dough add very little water (about 1 teaspoon) at a time and knead. If you pour all the water at once, dough will be sticky and watery. If by mistake dough becomes sticky then add little more rajgira atta and knead. Dough should not be sticky at all..The Dough should be not too soft not too hard. 3) Fry the pooris in a HOT Oil or Hot Melted Ghee. If oil is not hot enough, then it will absorb too much oil and will not puff well. 1) Boil the potato. Let it cool completey. Peel and mash it in a mixing bowl. 2) Add rajgira atta and Rock Salt /Sendha Namak and two tablespoons of ghee . Mix the whole mixture well.Dough almost come together. 3) Then add very little water, just about to 1 tsp and begin to knead the dough. 4) Again add ½ to 1 tsp water and knead so that there is no dryness in the dough. 5) The dough should not be sticky. If the dough feel sticky add some Rajgira flour and again knead well.Keep aside covered for 15 minutes. 6) Divide into equal sized balls. On a dusted work surface, make medium sized pooris, neither thin nor thick . 7) Heat sufficient ghee in a kadai and deep-fry the puris on medium heat till golden. Drain and place on an absorbent paper or paper napkins to remove excess oil. 8) Serve rajgire ke pooris hot with any vegetable curry/sabzi or paneer curry or chutney.